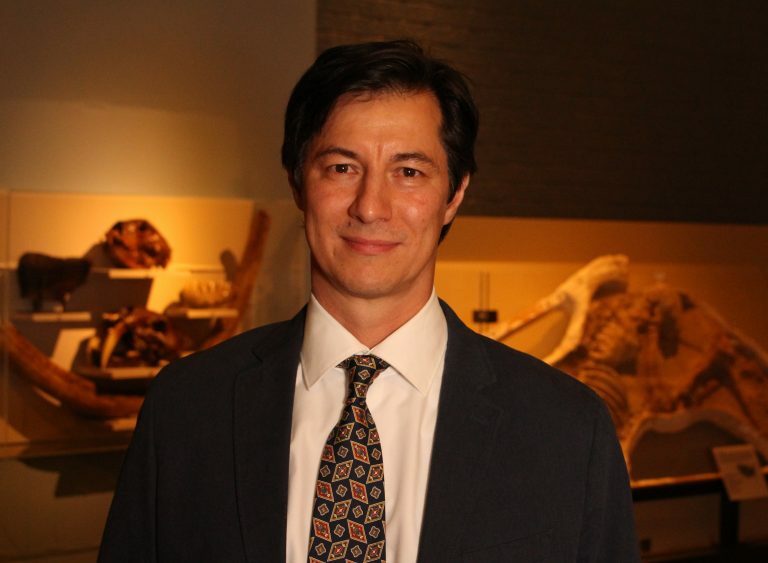 Dr. Wilson is an associate professor in the Department of Biology at University of Washington and also curator of vertebrate paleontology at the Burke Museum. He is a noted expert on the evolution of mammals immediately before and after the extinction of dinosaurs, with an active fieldwork program in eastern Montana. It is this research that Wilson has integrated with a K-12 teacher training program, the Discoveries in Geosciences (DIG) Field School (http://www.burkemuseum.org/programs/dig-field-school). The DIG program provides opportunities for teachers to participate in paleontology fieldwork, collaborate with paleontologists, and develop resources, curricula, and knowledge to apply in the K-12 classroom. Since its founding in 2010, nearly 200 classroom educators and 16,000 students from throughout the United States have participated. “It’s a huge honor to be recognized with this award from such an amazing school with a fantastic group of educators and scientists. I’ve been really fortunate to have such a great team of collaborators in both my research and the DIG Field School, particularly the grads, undergrads, and volunteers.” said Wilson. Dr. Greg Wilson has a strong track record of outstanding contributions to science and education, and the Alf Museum is pleased to honor him with the Raymond M. Alf Award for Excellence in Paleontological Research and Education. The Raymond M. Alf Museum of Paleontology (www.alfmuseum.org) is the only accredited museum in the country located on a high school campus, The Webb Schools. Students play an integral role in the discovery, excavation, preparation and research of their findings—often being published in scientific journals. The museum is open to the public Monday through Saturday, and over 90 percent of the fossils on display are found by our students. For more information, please contact the Alf Museum’s Director, Dr. Don Lofgren, at dlofgren@webb.org or (909) 482-5242.